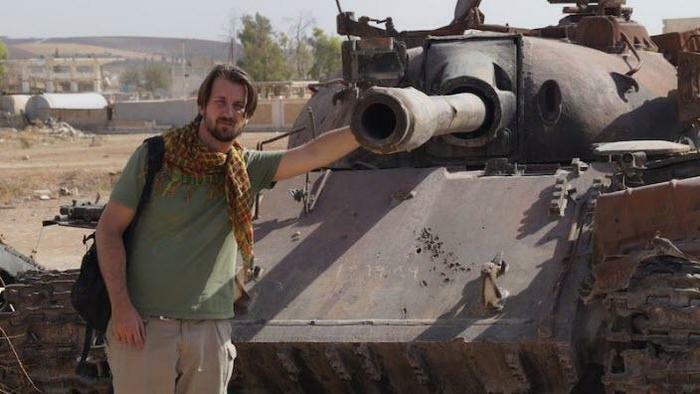 Wladimir van Wilgenburg, a Dutch postgraduate student in London, has covered the war in Syrian Kurdistan for most of the past year, including the campaign of the Kurdish-led Syrian Democratic Forces against the Islamic State and fighting between Kurdish militia and regime forces in Hasakah in eastern Syria. What is the working environment like for journalists in Rojava? Can you move around and report freely without supervision? The rules are different for foreign and local journalists. Local journalists need to have their outlet registered with the canton administration. One has to register separately with each canton. And you need to get permission each time you move from one canton to the other. I was able to move around freely without any minder. I did whatever I pleased with a translator or on my own. But if you go into an area where military operations are taking place, like Manbij for instance, then it’s tightly controlled. You can’t just show up. What would happen if you wrote negative stories? Would you be permitted to return Rojava? What are the red lines? There is a lot of tension between the PYD [the Democratic Unity Party] and the pro-Barzani [Iraqi Kurdish leader Masoud Barzani] bloc of parties forming the Kurdish National Council. If you interview [the KNC] and reflect only their views, they [the PYD administration] get upset. It’s also worth noting that they allow journalists who are sympathetic to the Syrian opposition and even to jihadist groups like Jabhat al-Nusra to come and senior officials grant them interviews. I saw this for myself. Can you tell us a little about the internal politics of Rojava? Who are the main players? Broadly speaking there are two blocs. The [Turkish Kurdish] PKK, the [Iraqi Kurdish] KDP, and their respective affiliates. So you have the PYD and TEVDEM [Movement for a Democratic Society] against the KNC. The strongest parties within the KNC are the Kurdistan Democratic Party of Syria (KDP-S) and the Yekiti party of Ibrahim Birro. Then you have a third bloc of parties that have some relations with the PYD and TEVDEM. Most journalists don’t know about them but they exist. Which of the parties are armed? There is the [PYD’s militia] YPG of course. The pro-Barzani parties have fighters but they are based in Iraqi Kurdistan where they are fighting against ISIS [the Islamic State in Gwer, Sinjar and in Khazir, so [they are] getting battle-hardened. Ibrahim Birro, the leader of Yekiti, was recently kicked out of Rojava [Syrian Kurdistan]. Why? Well the KNC says it doesn’t recognize the local administration, or its laws. Their differences date back to October 2014 when their power sharing agreement [brokered by Masoud Barzani] broke down completely and Turkey played a role in this. Since then, tensions have been growing worse. Several KNC leaders were arrested after staging protests. The PYD says they were arrested because you are supposed to seek permission from the local authorities before staging a protest. The KNC says it won’t seek permission from an administration that it does not recognize. Relations between the PYD and Turkey and between the PYD and Barzani are also very bad and this is reflected through local rivalries, tensions, and arrests. For instance, the KDP prevents PYD politicians from traveling through their territory to Europe. And the PYD also put restrictions on KNC entering Rojava. Turkey also supports the KNC and wants it to have more influence, which often makes life worse for the KNC. How would you describe the ideological differences between these two blocs? The KNC says it wants a Kurdistan region in Syria similar to what the Kurds have in northern Iraq. But that is hard to achieve because if we draw a line from Derik to Afrin [in northwest Syria] and accept this as Rojava, the Kurds will be in the minority. I don’t much believe in percentages, but the Kurds would amount to around 40% of the population in that band of territory. Going back to the differences, PYD and TEVDEM say they want federalism for northern Syria but they want this not just for the Kurds but also for other groups, meaning Christians and Arabs as well. How much support does the KNC have? There is no way to measure this because there are no elections but the KNC parties have a good amount of support in al-Hasakah province — as you go towards Afrin and Kobane, significantly less so. The PYD and YPG are especially popular in Kobane. Also you have a lot of Kurds who support Barzani who don’t necessarily support the KNC. People often draw comparisons between Rojava and the Iraqi Kurds’ administration? Are there any similarities? The political dynamics are very different in Iraqi Kurdistan where you have two political parties, the Kurdistan Democratic Party and the Patriotic Union of Kurdistan, governing over two separate zones. Yes, you do have a [Iraqi] Kurdistan Parliament and a [Iraqi] Kurdistan Regional Government that binds them but they are still quite separate in many ways. This fracturing was avoided in Rojava because they resisted the KNC’s attempts to divide territory and power. Rojava is far more bureaucratic and better organised. And there are obviously ideological differences. Rojava is all about self-sufficiency, communalism. Tell us about the Syrian Democratic Forces (SDF) Does the YPG call all the shots? There isn’t much difference between the YPG and the SDF, its kind of like two different names for the same group. The SDF is a coalition of different factions but the dominant force is the YPG. It’s impossible to call it “Kurdish” anymore because the YPG is recruiting a lot of Arabs, especially in Manbij and Shadadi. The number of Kurdish recruits from Turkey has gone down. Military service is obligatory in the cantons so the draft applies to all local residents including Christians, but this does not necessarily mean they will be fighting on the frontline. The Christians are happy about this and the Syrian Orthodox Patriarchate just put out a statement criticizing the forced drafting of Christians. So do the Arabs support the canton system? They deal with the realities on the ground. They look at who is the dominant actor. Plus they get salaries from the administration. Something between $30 to $50, the same as Kurds working for the administration would. 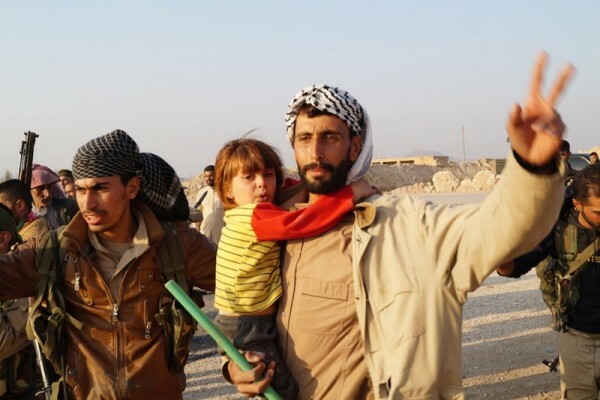 Their families enjoy protection again as the YPG fighters’ families would. Is the Rojava experience rubbing off on the PKK? Transforming it in any way? It’s hard to pin down. There are some PKK in the leadership and among the cadres [of the Rojava administration] but the PKK likes to keep things separate. I don’t see them changing their own rules but they have to deal with the reality on the ground. You can’t have everyone living like PKK cadres. There is a difference between PKK cadres and the YPG fighters who can marry and have kids. Also some YPG fighters volunteer for a given period and return to civilian life when the battle is over. What exactly is the relationship between the PKK and the Rojava administration? It’s difficult to understand this relationship between Qandil [the PKK headquarters in the Qandil mountains in Iraqi Kurdistan] and Rojava. There are a lot of administrators who were in Qandil. But it’s unclear to me whether they do their own thing or report first to Qandil and then do it. How important is Abdullah Ocalan in Rojava? Ocalan is viewed as the person who created the idea of Rojava, who came up with the whole system, who embodies the “Rojava Revolution” as they call it. You see his pictures everywhere. He’s a symbol. If Turkey and Ocalan struck a deal whereby the Rojava authorities gave up on linking the cantons with Efrin, and in return Turkey normalized relations with Rojava, allowed unfettered access to Efrin, and helped to rebuild Kobane, would the Syrian Kurds accept this? It’s very complicated because they have been talking about Efrin for such a long time. Giving up on connecting Kobane with Efrin would be a tremendous loss of face. Yet the Rojava administration can be very pragmatic. If there are real guarantee that Efrin will no longer be besieged by Syrian rebel groups and that it’s secure and that Syrian Kurds are allowed to travel freely to Efrin via Turkey without any negative repercussions of any kind, then perhaps. But there needs to be a lot of trust between Turkey and the canton administrations. What if Ocalan stepped forward as a guarantor? Well I think its very hard for them [the Rojava administration] to go against anything Ocalan says. But then Ocalan is not stupid either. He will not commit himself in ways that would damage his own credibility. More likely he will make vague pronouncements that can be interpreted in many different ways. I don’t think he can make concessions to Turkey without securing something substantial in exchange like decentralization in southeast Turkey, letting the Kurds have their own political system. I do think if relations improved between Turkey and Rojava, it would be better for Syrian Kurds’ economic future. Until relations are normalized they can survive but not much more. The US has repeatedly said it will not help the YPG connect the cantons. At the same time the US envisages a key role for the SDF in capturing Raqqa. Is the YPG ready to do Raqqa without US help in linking the cantons? TEVDEM officials say they want recognition of their federal region [the Northern Syrian Democratic Federation] and that they want to be at the table during any future Syria peace talks. They are unlikely to do Raqqa without support for linking the cantons. The Americans seem to be trying to make up for the lack of support by offering the YPG more weapons. If the Americans don’t help them, then they will work with the Russians to capture al-Bab [in Aleppo Province]. Its not 100% confirmed whether they received Russian help in doing so but the YPG recently captured ten villages moving eastwards from Afrin towards al-Bab. They are 25 to 30 kilometers away from al-Bab. After five years of self-rule, how separate is Rojava from the rest of Syria? It’s getting more and more separate. For instance, the official Syrian education system is being phased out. Most education is now in the Kurdish language but Christians are allowed to have their own Christian education and the Canton Administration formally announced this. The Arabs are also permitted to have their own separate schools. Are any of these schools funded by the central government? Teachers in the new schools are paid directly by the canton administrations. And those among them who previously worked for schools run by the central government no longer receive salaries from the central government. How does the Rojava administration fund teachers’ salaries? By taxing civilians and through its control over economic resources in northern Syria, like oil for instance. So do kids born after the canton administrations were declared in 2012 learn Arabic? They do, but not as their main language. How secular are the Syrian Kurds? I think the Syrian Kurds are quite secular because Syria in general is quite secular. This has nothing to do with the PKK YPG ideology per se. The Syrian Kurds are not very observant and there aren’t that many women who cover their heads. There is a lot of talk about women’s rights in Rojava. How much real power do women actually have? Women are far more powerful now in Rojava than they have ever been. So much so that even parties that oppose the PYD joke about it saying, “We no longer have any power as men.” Marriage of minors has been banned. Polygamy [permitted under Syrian law] has also been banned in Rojava. The canton administrations are very eager to pass new laws to improve women’s rights, even though there is some resistance to this among locals. There are plenty of women in key positions. But when you look at the pro-Barzani parties the number of women in power is close to zero. While there are numerous women fighters in the YPG, mandatory conscription applies to men only. How would you characterize relations between the Syrian Kurds and the Assad regime, particularly after the regime bombed YPG targets in al-Hasakah? I think the YPG was initially quite happy about what happened in al-Hasakah because they gave a message to the Assad regime. The message was: “Don’t think you can do your deals with Turkey and that there will be no consequences.” As you know there was a lot of talk at the time of secret deals between Turkey and the regime that targeted the Kurds. And the American chased away the Syrian planes. But the situation changed when Turkey intervened in Jarablus soon after. The timing of the Turkish intervention suggested there was a deal between Turkey, Iran, Assad, and Russia. So do you think what happened in al-Hasakah is part of an emerging pattern of regime-YPG confrontation? Not necessarily. A lot of the tensions are local There have been clashes between pro-Assad militias and the YPG. For instance in Qamishlo, a pro-regime Christian militia was unhappy about checkpoints set up by the Asayish [Kurdish internal security units] and so there were clashes. [But] Assad’s strategy is to deal with the insurgency first. Once he feels stronger he will of course shift his gaze to the Kurdish areas because this area is rich in oil and agriculture. He would not want to leave this in the hands of the Kurds. What sort of contact is there between the regime and the Kurds? There is an airport in Qamishlo controlled by the regime. And there are civilian flights between Qamishlo and Damascus. In the past, there was medicine coming from Damascus to Qamishlo but recently because of the tensions that has stopped so there are huge medicine shortages in Kobane and Cezire cantons. There are still some economic deals with oil and products being sold back and forth. How do the Syrian Kurds get along with US special forces? It’s difficult to gauge. You see them riding around but reporters are not allowed to get close to them, especially after the incident when they were photographed with YPG patches on their uniforms. The YPG does view the whole thing as more of a tactical alliance but its very popular among locals. Be they pro or anti-PYD people like westerners. You will never hear anti-PYD people criticizing this alliance with America. They say American support is good and that there should be more.